An economical choice for larger classrooms, our Economy Paint Palettes x 10 are a highly practical resource no teacher should do without. 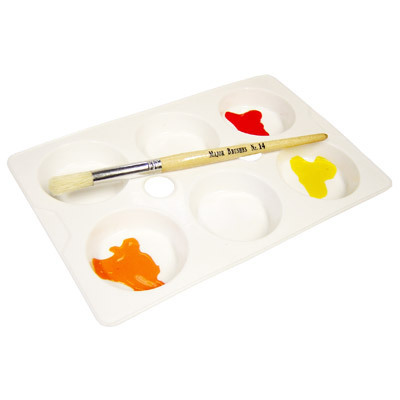 These white, flexible plastic pallets each feature 6 wells for distributing a range of paints in and can be used as a mixing tray as well. Featuring two holes down the centre, the tray can be held off the table with fingers making it perfect for use with upright easels. Versatile in its design, why not use these paint palettes for other purposes such as separating out items during crafting including sequins or glitters? While you're here, why not take a browse through our Arts and Crafts category for all range of products including Paints & Inks through to Papers and Card.